Located only 10 minutes away from Heavenly Village. There’s always excitement at Harvey’s. Savor the culinary treats at all our spectacular restaurants, including the Hard Rock Café and Cabo Wabo. Or enjoy our fitness center and year-round heated pool and hot tub. Take in the variety of shops and services in our lobby, including a beauty salon, gift shops and video game arcade. Or join us for an exciting yacht cruise aboard the Tahoe Star, our 54 foot luxury yacht offering once-in-a-lifetime trips on the crystal clear waters of Lake Tahoe. All making Harvey’s an ideal getaway! 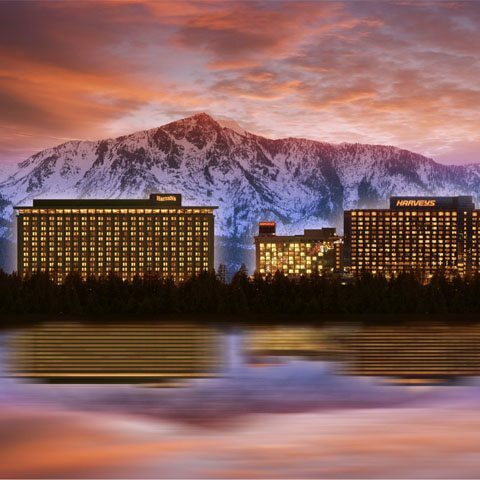 Harvey’s Lake Tahoe has over 88,000 square feet of gaming space that includes more than 1,200 of the most exciting slot machines; nearly 100 live action table games, and the Lake’s largest Keno Lounge and Race/Sports Book. Harvey’s Lake Tahoe Casino has over 900 of the hottest Lake Tahoe slots, including the only Wheel of Fortune Super Spin machines in Northern Nevada. Then t’s all in the numbers when you play Video Keno at Harvey’s Lake Tahoe.